School is out for about 18 million students as midterm break commenced on Friday. Students at schools in Edirne, the northwestern-most province, to Afrin, Syria, which Turkey helped liberate from the terrorist People's Protection Units (YPG), received their report cards ahead of the 17-day recess. It was also a bittersweet time for Syrian refugee students who spent another year far from their war-torn homeland and for Turkish students who would remain separate from their classmates. The break, on the other hand, is a relief both for students and their parents as it also means the disappearance of thousands of school buses from traffic, especially in big cities. The occasion is also a much-anticipated period for tourism businesses, with hotels and ski resorts, already reporting full bookings for 17 days. In line with tradition, government officials visited schools to deliver report cards to students. National Education Minister Ziya Selçuk was in the capital Ankara's Gölbaşı district at a primary school. Selçuk advised students not to spend the recess too lazily. "You should do new things. Visit your grandparents or relatives. Have more fun with your friends. Read books. You don't have to spend it doing homework. I'd be pleased if I saw you were interested in better things, such as helping your friends or caring for animals." 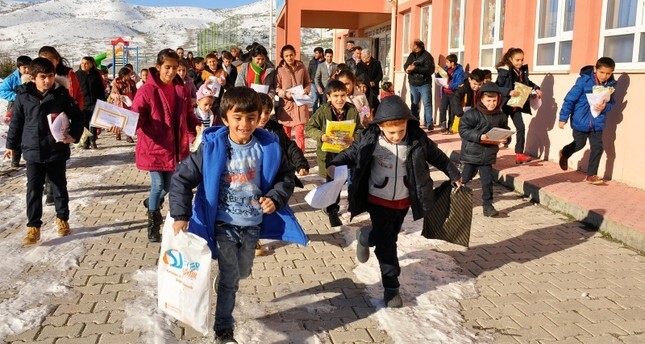 Hundreds of kilometers away in the southeastern city of Şanlıurfa, Syrian Kurdish children expressed their longing for their home though they were happy to end the first semester with good grades. Şanlıurfa is home to more than 500,000 Syrians who fled to this border city, as the eight-year-old civil war in Syria showed no sign of dwindling. About 48,000 students of Syrian origin received their report cards from their teachers at public and private schools in the city. Among them were Kurdish children whose hometowns are occupied by the YPG, an offshoot of the terrorist PKK. K., a Syrian Kurdish student who attends a school for Syrians in the Haliliye district of Şanlıurfa, told Anadolu Agency (AA) that they were forced to leave Qamishli, Syria, due to "pressure" there. "We have been here for about eight years, and I don't feel like a stranger anymore. People treat us very well. I don't have communication problems since I can speak Kurdish, Arabic and Turkish," the ninth grader said. He is happy to be in Turkey but still wishes to go home. "I hope the war will end, and we can go back. I still have relatives there. We would stay if Qamishli was safe," he said. K. dreams of becoming a teacher someday and serving his country. A., who hails from Kobane, Syria, arrived in Turkey when she was 6 years old. Now 11, she barely remembers her hometown. "I only know it from what my family told me. We are happy here; we can go to school, but I am still curious [about Kobane]. We can return if bad days end," said A., who plans a career in medicine. Turkey is home to more than 3.5 million Syrians, the largest Syrian refugee population in the world and strives to restore their shattered lives. Education is the main concern for refugees, as young people and children make up the majority of Syrians taking shelter in Turkey. Officials say nearly 62 percent of Syrian children, about 655,000 refugee children, have integrated into the education system in the country, and they aim to increase this number to 100 percent by reaching out to more families and with funds from the European Union. "About 91 percent of children at the primary education level are enrolled in school. This is a good number. However, when it comes to preschool, middle school and high school, the number goes down. It is important to increase preschool enrollment to a higher level," Deputy National Education Minister Reha Denemeç said at a recent meeting on Syrian children's education.